Everyone knows there are 365¼ days in a year—except, seemingly, the Bible... In both Genesis and Revelation, there are 360 days in a year and 30 days in all months. You won’t find the 365¼ day year and alternating 29 and 30 day lunar months we see today. Does this mean the Bible is an inaccurate book (as skeptics believe)? Not in the least. 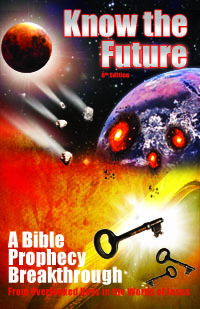 Read on to find out the little-known calendar secret of ancient history from Genesis and also Revelation’s hidden prophecy about earth’s change to a 360 day year because of a global catastrophe—before the rapture. The Book of Revelation contains many insights and predictions to encourage, thrill and scare you. Some are plain and obvious; others are subtle and hidden from most, only to be found by the few inspired to dig deeper (Dan 12:4, 9-10; Rev 1:1-3). For example, that an evil beast-like ruler will dominate the entire earth (Rev 13:7) for the last 42 months of this age (Rev 13:5) is plain and easy to understand. That a major change to earth's orbit is predicted by this and related numbers is not obvious at all. Daniel 9:27 tells us that the Abomination of Desolation and ceasing of the daily oblation will happen in the "middle" of the 70th week (or final 7 year period) not in the beginning of it. Jesus also says at the time of the Abomination of Desolation that it will be urgent to head to the place of safety (Mt 24:15) as "great tribulation" follows it (Mt 24:21). Half of 7 years = 3½ years. Revelation 12:14 says that the Woman is protected from Satan for the same amount of "times" (3½) as the Little Horn oppresses = 3½ years. Revelation 11:2 says that Gentile armies will trample Jerusalem for 42 months. Revelation 13:5-7 says the Beast (Antichrist) will blaspheme God and conquer the saints for 42 months. Revelation 11:3 says that the Two Witnesses prophesy during this same period for 1260 days. In other words, the 1260 days of the Two Witnesses is the same 42 months that the Temple Mount is trampled while the Little Horn/Beast speaks against God and oppresses the saints (Rev 11:1-3=Dan 7:25=Rev 13:5). It is also the same 3½ years that the righteous "Woman" is protected in the wilderness (Rev 12:14). All these events relate to the tribulation when the Antichrist continues for "a time, (pair of) times, and half a time" as Daniel 7:25 says. Is this consistent repeated length of 3½ years for the tribulation surprising to you? I can appreciate if it is as most Christians have been taught that the tribulation or great tribulation is seven years long." However, as you can see, the only time "seven years" is mentioned in connection with the great tribulation is for entire seven year 70th week. The great tribulation is only the second half of that. The first half is not called "the tribulation" also but has another name given by Jesus: the "beginning of birth pains/sorrows" (Mt 24:8; Mk 13:8). By the way, if you doubt that a basic math error of this kind could really creep into Christian doctrine, then consider how there are not "three days and three nights" (Mt 12:40) between a "Good Friday crucifixion" and an Easter Sunday resurrection! So, why do Daniel and Revelation give us three different measurements of length for the same time period when all that was necessary to establish the length is to use one measurement such as "three and one half years?" 29.531 days per lunation. The Hebrews used lunar months, or the cycle from new moon to new moon. This is reflected in the Hebrew word for month (chodesh) meaning also moon, similar to how the etymology of "month" is related to the moon. It is also a mismatch of both the (fixed, precalculated) Rabbinic Jewish and (observed, lunar-agricultural) Karaite calendars of today. Both of these calendars have 29 day months mixed in with 30 day months instead of consistent 30 day months. Since this amounts to around only 354 (not 360) days per year, every two or three years a 13th or leap month (Adar Bet) must be added to intercalate the calendar (keep it in sync with the seasons). Given that a 360/30 calendar does not match our 365¼/29½ reality, it is very tempting to dismiss the great tribulation numbers above as not intended literally, but as convenient approximations. But again, why even bother to give these redundant "approximations" if all we needed was to have any one of these lengths to give us an idea of the breadth of the reign of the Antichrist? If it means what it literally says, then what we have hidden in those numbers is an implied prediction of a coming change of the calendar through a shortening of the year by five days before the Great Tribulation begins. In other words, the earth's orbiting time must decrease around 1% by the time the Antichrist takes power to shave five days off the year. Is that even possible? Yes, it is not only possible, but it appears to have happened before(!). Catastrophism should not be a strange concept to those who have read the Bible. The deluge in Noah's day was just such a thing. Even atheists commonly accept that the dinosaurs were wiped out when an asteroid or comet struck the earth. That, too, is catastrophism—and of a kind that could explain how the calendar of the earth could change and probably changed before. Noah's Flood: During the time of the flood Genesis tells us that 150 days started on the 17th day of the second month, and ended on the 17th day of the seventh month or exactly five months later (Genesis 7:11, 24 and 8:3-4). 150 days ÷ 5 months = 30 days per month. 30 days × 12 months = 360 days per year. King Ahaseurus' 180 Day Feast: Esther 1:4 implies a 360 day year or consistently 30 day month by recording that the feast continued exactly 180 days. Whether the feast is meant to fulfill half a year or six months, neither approach would arrive at 180 days under a 365¼/29½ cosmology but both approaches would work under a 360/30 calendar. The Bible is not the only ancient testimony we have of the ancients living in a world of 360 day years and 30 day months. There is much historical evidence from ancient history that we were on a 360/30 calendar once before; (from which we get our 360 degrees of a circle). In fact, there are over a dozen ancient calendars with 360 day years or 30 day months before the 8th century BC. After that, the calendars changed. Did something happen in the 8th century BC to require calendars to be updated? From Chuck Missler I first learned an answer to this question. There is evidence that Mars used to be on a different orbit that brought it dangerously close to earth. Chuck Missler talks about how it came so close it brought catastrophes with semi-regularity. From this past we may have much of the dread and ferocity associated with the name Mars (as in "martial arts"). In the last interaction with earth, it both modified earth's orbit and its own so that it has the present "safe" orbit seen today. But what about the 30 day lunation becoming 29½ days? If Mars perturbed the orbit of the earth to move further away from the Sun and take five days longer, then automatically the lunar cycle would shorten from 30 days to the current 29½. If you are as fascinated by these ideas as I am, then I suggest reading the book The Mars-Earth Wars for more details. If Mars is now in a different orbit which never brings it close to earth anymore, then it is not likely to reverse what it did before to our calendar. However, there is another object mentioned by Revelation that can make this calendar reversal right on time for the great tribulation. The great tribulation of Daniel is also described in Revelation; from the 5th trumpet through 7th trumpet. Not surprisingly, the 3rd and 4th trumpet describe global catastrophic effects—polluted fresh waters and a "nuclear winter"-like darkening of the sky, respectively—blamed on a wayward "star" called Wormwood. What is this Wormwood and how could it work? It's important to note that the Greek word aster translated "star" in English Bibles is not specifically a star but refers to any unknown object in the sky whether it be a meteor, asteroid, moon, star or planet. While a star could not come anywhere near earth let alone "fall upon" it and an asteroid is too small to affect earth's orbit, a dwarf planet would explain all the catastrophic events described by Revelation as leading up to the Great Tribulation. For example, before Wormwood is mentioned at the 3rd trumpet, the 1st and 2nd trumpets describe a storm of meteorite and asteroid impacts on the earth. This would readily contaminate fresh water with everything imaginable. The resultant impacts would also send particulate into the atmosphere. Both of these impact results readily explain the 3rd trumpet poisoned waters and 4th trumpet blocked sunlight, respectively. Before all that, the 6th seal describes a great global earthquake and multiple eclipses with a meteor shower. How do we explain that? Finally, Wormwood would have itself tugged back at the earth to not only cause the global earthquakes, but it would also "perturb" earth's orbit enough to shorten our year to the 360/30 calendar that begins at the 5th trumpet or Great Tribulation. This will require moving the earth into a closer or smaller orbit with the sun. "What About A Glancing Blow?!" I think you may be mistaken to believe that the earth’s orbit speed will be increased in order to shorten the orbital year to 360 days. One point to consider as an argument against that theory is that the lunar month will not necessarily change if earth is given a "boost" by Wormwood. I believe that it is more likely that the earth’s rotation about it’s axis will slow down as a result of Wormwood striking a glancing blow from east to west. If you give this theory just a moment of critical thought you'll see how it simply does not work. The 24-hour day is a result of the earth spinning at 1000 miles per hour. To shorten the day, you have to speed up that spinning. A "glancing blow" from an asteroid would accomplish this instantaneously and the results would be beyond catastrophic. They would be fatal to all. The sudden change of rotational speed would send all lifeforms and objects spinning at 1000 miles per hour flying into space compared to the new increased speed of the earth. It does not work. What a bizarre theory. What I'm proposing is much more gradual. Wormwood and earth do not collide like two billiard balls. It gradually approaches earth, tugs on it and breaks up as a result of Earth's reciprocal and greater gravitational tug. Earth wins, but is perturbed from its orbit enough to effect a faster orbit and reduction of 5¼ days to the year. Many pieces of Wormwood "fall upon" the earth (Rev 8:10) but their effect is not one of complete destruction but much less, affecting one third of the fresh water (Rev 8:11). What will the result of this be? The world will be a shell-shocked. Civilization will be smashed. The lights will be out. Homes will be flattened from the earthquakes and impacts. All the food will be burned up, buried or contaminated with no hope of growing more with the diminished sunlight. People will literally be starving to death in the cold. Those with food will be killed for it by stronger gangs. It will be total chaos and hopelessness. The world will need a "strong hand from somewhere" to restore order, shelter and food production. This is exactly when the Antichrist appears and offers a solution. With the power of Satan (2Th 2:9) he is able to convince the world that he is God himself (2Th 2:4) and the only one capable of fixing the mess...for a price (the mark of the beast). And part of what he will be fixing is the calendar. Out with the 365¼ day year, in with the 360 day year (Dan 7:25 ?). For how you will survive Wormwood and escape the Antichrist, see my article on Faith to Escape. I don't believe in the Nemesis theory (although the Melancholia movie was pretty cool). With the recent comet and asteroid fly-bys, I could definitely see a comet or meteor hitting Earth soon. The Hebrew calendar has 360 days, and then adds an extra month (360calendar.com). Every 40 years the number of Hebrew calendar days equals the number of Gregorian days. Since the Hebrew mind might consider the basic year to be 360 days, I don't see a need for a catastrophe. 1. This thirteenth month he requires is never mentioned in the Bible! Out of dozens of dates described in the Bible, including all twelve months of the year, there is no date for any event in a "thirteenth month." It is completely unknown in the Biblical record. If an adjustment to the solar calendar by a thirteenth month was the practice in Biblical times, there ought to be a mention of the practice or at least a date using it. We have neither. With no mention of a thirteenth month, it is only justified to assume a year of twelve months in Old Testament times (at least up until the time of Hezekiah when the calendar finally changed to what we see today requiring a thirteenth month). 2. He completely ignores that a 30 day lunar cycle is required by the 30 day biblical month which does not match the current 29½ day lunar cycle! Months in the Bible were moon-based (Ps 104:19), just like the Islamic and Jewish calendars are today. Rather than being arbitrary counts of days out of sync with the moon like our Gregorian calendar, they began at the new moon. The Hebrew word for moon, month and new moon day are all the same in biblical Hebrew: chodesh. Thus, the 360calendar model only works if you invent a thirteenth month and ignore the 30 day lunar cycle required by the 30 day biblical month. The model fails to explain how Genesis and Revelation can refer to a 360 day year and 30 day (lunar) month. Conversely, the catatrophism model explains how an original 360/30 cosmology changed around the 9th century BC when a dozen 360/30 ancient calendars changed...and how it can change again from our current 365¼/29½ cosmology back to 360/30. People may not believe Wormwood is literal or see a catastrophe as necessary to explain the 360/30 calendar of the Bible, but the fact remains that Revelation (from the 6th seal through 4th trumpet) already literally describes and predicts a series of grave global catastrophes that include deep impacts and other evidence of a close flyby from a visiting body including a global earthquake and double eclipses. Instead of the iffy "Nemesis theory," call this the sure Wormwood prophecy. If according to this prophecy something big is passing that close to send fragments on the earth (meteor shower, meteorite storm, asteroid in ocean) and to cause a great earthquake moving every mountain and island out of place and maybe also cause the eclipse of the sun/moon...it can also explain why the calendar is 360/30 again according to Revelation's description of the Tribulation period that follows immediately after the Wormwood catastrophes finish. If more people were familiar with catastrophism, the ancient 360/30 calendars and the synchronization of the biblical month with the lunar cycle, less would invent or believe the calendar models like the 360calendar site describes. Marlen, yes, the crucifixion had to be on a Thursday Passover before a Friday Unleavened Bread #1 Holy Day and Saturday Sabbath. People find ways to fit Friday or Wednesday who count just “three days/the third day” but when you pay attention to the “three days AND THREE NIGHTS” only Thursday fits the full criteria with the pre-dawn Sunday night resurrection specified. This is a strange coincidence. I had been researching the past history of earth for a while now. What you wrote about time was correct. The calendars and all the monuments are true. You are correct saying something happened in the past. I changed about 12,000 + years ago. The biggest cataclysmic event at the time compounded by the flood. Which may have been at that time also. This is not really out of sequence with the bible. In research the world has been destroyed 2 times in the past where most life was required to change because of events. Believe me I do understand your beliefs, I was there. I am not saying you are incorrect, or anything of the sort. You for your studying and research is awesome. You have a lot of the best interpretations I ever seen. I love the fact the you are able to be fluid with things. We need people like you. You may not like, or agree in what I say next. I do not like any religions. They all have truths. None of them with all. More wars have been fought in the name of God then any other thing. I think I read (not exact) there a 450 conflicts going on now 430 are religious in nature. End times, probably. Richard, I’m not offended by anyone saying they do not like any religion. I think Yeshua would agree and will ban them all when he comes back in favor of people following the Word of God directly as he taught and did (Lk 8:21). good article tim! is there a 9th edition of know the future coming anytime soon? Mike, thank you. I have had no time for a 9th edition due to the demand for support team content explaining what Yeshua taught and how to actually do it, something God is blessing greatly. I keep seeing the numbers 444 all the time. Do you know what they mean? Stephanie, noticing the same number over and over means you’re experiencing the cognitive bias of frequency allusion. Thanks for providing a link “frequency allusion”. I have had a similar thing happen recently. Something would make me glance up at my digital clock in the car, at home or at work and every time I did it was 11:11. Either AM or PM. I thought for awhile it may mean something, but now, after going to the link, I see it’s rather common. Tim, What are your comments that “worship services”, or church services, should still be done on a Saturday, or Sabbath day. Most churches meet now on the first day of the week, Sunday. (I do know the history of this day!) Thanks!! Barbara, the Sabbath was never about worship gatherings, but rather rest from work. Originally even saying “do not leave your place” (Ex 16:29) which kind of precludes meetings. Isaiah 66:23 says in the Millennium worship gatherings will be on that day. But today there is no universal law on this. Even if there were, can you imagine anyone getting in trouble for having Yehovah worship meetings on a Sunday or other days of the week? =). Michael, “assembly/covocation” is a poor translation of the Hebrew word miqra, or “rehearsal”. The Israelites were never told to assemble on Sabbath as they were on most of the other moedims of Lev 23. I think they could, but Sabbath was not originally about gathered worship. It was no-work day. People lose sight of that when they argue Sunday worship is a heresy because of Lev 23 =). In the case of the Sabbath day miqra, by resting on the seventh day, the Israelites were “rehearsing” for us the “Sabbath Millennium” rest that the people of the Millennium will experience under the Kingdom of God from the work of war, deception, Satan, demons, etc. I also have some concerns about church on Sundays (although I go) being exactly what Jesus spoke of in Mark 7 and the traditions of men versus the commandments of God. Cook, Jesus went to synagogue because that’s where he could access the Bible and where his audience was, not because he needed to worship there. Back then, unlike today, people did not have personal copies of the Bible in books. Only synagogues, scribes and rich people had scrolls of the OT. If you study all the passages on Sabbath in the Gospels you’ll find at every opportunity Jesus denies any need for keeping Sabbath or ignores the command entirely (Mt 19:17-19). It’s quite eye-opening for someone coming from the theory that A) he kept Sabbath and B) he did so as an example to us. His own words and actions contradict that assumption. Simply put, he was born into Jewish culture where all were keeping Sabbath out of tradition which was fine, but not required since Israel was cast out of the land for breaking the Old Covenant which ended with the exile. Thus, Sabbath at that point had turned into a tradition of men itself with all the additions they had made. As part of the Old Covenant Torah, it was no longer required by God on Israel for a long time by then. There is not a single verse saying “and Jesus rested/stayed home/fasted/went to Synagogue/etc. that day because it was the Sabbath.” He went to synagogue “as his custom was” as was the custom of that culture, not because God required Sabbath synagogue attendance nor even Sabbath rest at that point. Thanks Tim, that was an interesting essay. All old calendars, i.e., Inca, Aztec, Chinese, Hindu, Greek, Egyptian and Hebrew were all based on a 360 day year, 30 day lunar cycle. All of these calendars changed to the present 365.25 day calendar at the same time. If anyone doubts that a year was originally 360 days in length, ask them why a full circle has 360 degrees. Tim, With all the concern over global warming and many different theories as to it’s cause, I was thinking that “Wormwood” might be blamed on global warming. I think it was Obama that even blamed wars and revolutions on global warming and Gloria Steinem blames forced childbirths. That would sure explain the fanaticism of the world accepting the anti-Christ and an extreme hatred for Christians. I’ve argued with people before on the subject and could see an almost physical change come over them when discussing global warming. Global warming and its theorized cause is like a religious belief for some. Maybe the event of Isaiah 38:8 was the cause of the calendar change. When God did this maybe just a slight orbital change was the cause, thus affecting future calendars. I read until I saw mention of the earth’s “orbit.” The earth is fixed. It sits on pillars. We are told this in the Bible. Joseph, your loss if you stop reading my insights only because I’m not a flatearther like you, but you should know that the Bible also records “God hangs the earth on nothing” (Job 26:7), another poetic statement just like your 1Sam 2:8 that you choose to take literally. Neither are intended literally, but are as figurative as the statements around them talking about horses laughing (Job 39:22).